You are what you eat! What you eat is one of the most important aspects of maintaining a healthy body and reaching overall wellness. Proper diet can decrease your risk for illness like diabetes and heart disease and can help you to maintain healthy body weight. 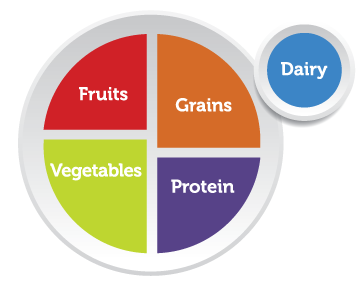 It is recommended that meals should emphasize fruits, vegetables, whole grains and low-fat dairy. Include lean meats, poultry, fish, beans, eggs and nuts. Adding fiber to your diet can promote healthy digestion and can help you to feel full for longer. Make sure you drink enough water and avoid sugary drinks.Staying healthy and following a nutritious diet is not about depriving yourself of good food and does not require long hours of planning meals. It only takes an extra minute to make a careful decision about your meals and the results are worth the extra time. Once you have changed old habits, the commitment will become easier and easier. Follow these simple rules to make sure you are making the most nutritional decisions at meal time. Supplements are a good way to ensure that you are getting proper nutrients and are great to incorporate into a healthy diet but they should not serve to replace meals. Exercise is not only a great way to lose weight but it is also a great way to keep from getting sick. Medical researchers with the AMA (American Medical Association) found that physical inactivity contributes to a variet of chronic diseases and health complications. They found increasing exercise and physical activity has proven effective in the treatment and prevention of these and many other disease. Begin with cardio training, the American Heart Association recommends 40 minutes of aerobic exercise three to four times a week to reduce blood pressure and your risk of cardiovascular problems. Medical professionals encourage a strengthening program three times a week in order to increase metabolism, muscle strength and to decrease your risk for developing osteoporosis. We recommend a program that includes cardio training, strength training, flexibility and relaxation in order to reap the most benefits out of your exercise routines. It is important to remember that a combo of weights training, cardio and nutrition are essential for creating results. You will see a difference in the way you feel, look and by the amount of energy you have. Every little thing counts! If you would like information on beginning a healthy exercise regimen or tailoring an exercise program to fit your needs, Dutch Physical Therapy can help you create an exercise program. www.DutchPT.com. Take time for yourself. It is easy to get so wrapped up in the demands of everyday life that we can neglect our emotional well-being. Unplug from social media, television or the cell phone and take time to reflect and meditate. 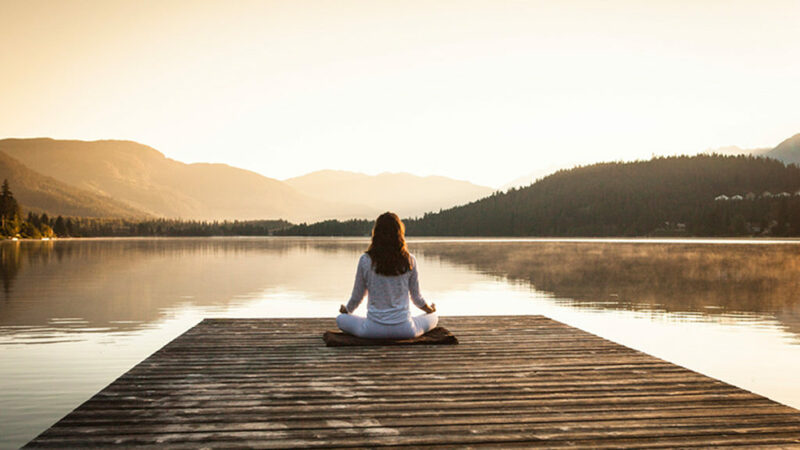 This can include meditation or relaxation techniques used in yoga or tai chi or simply a taking a quiet moment by yourself. Sleep is an influential factor in your overall emotional state as well. According to the National Sleep Foundation, most people need seven to nine hours of sleep each night for their body to function properly. Sleep is natural, healing and restorative and is necessary for the body to feel rejuvenated. Meditation or breathing exercises are a great way to relax and improve your emotional well-being because it allows the body to slow down. In fact it can actually improve more than just emotions; according to a 2011 Harvard University Study, meditation can improve blood pressure, sleep, anxiety and depression. Additionally, a 2010 Wake Forrest University study concluded that meditation can also decrease perception of pain and improve cognitive processing. To begin meditating, close your eyes, breathe using your abdomen only. Inhale for five seconds then exhale for five seconds focusing your thoughts on each breath so that your mind can clear and not wander on the events of the day. Rest. Rest and protect the injured or sore area. Take a break from any activity that may be causing your pain or soreness. Ice. 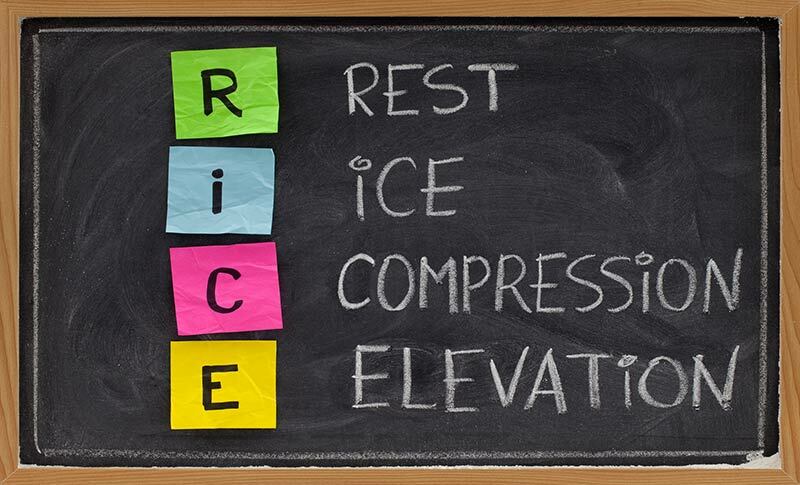 Apply an ice or cold pack right away to prevent or minimize swelling and reduce pain. Apply the ice or cold pack for 10 to 20 minutes, 3 or more times a day. After 48 to 72 hours, if swelling is gone, apply heat to the area that hurts. Do not apply ice or heat directly to the skin. Place a towel over the cold or heat pack before applying it to the skin. Compression. Wrapping the injured or sore area with an elastic bandage (such as an Ace wrap), will help decrease swelling. Be careful not to wrap the injury too tightly as this can cause additional swelling below the affected area. Signs that the bandage is too tight include numbness, tingling, increased pain, coolness, or swelling in the area below the bandage. If you experience pain while exercising or in your everyday life, you need to pay attention to these red flags and know when to seek care from your health care professional. If you have noticed one of the red flags or if you have any of the symptoms listed, you should consider seeing a physical therapist to discuss your options and needs. Physical Therapy (P.T.) addresses and handles the underlying cause of a patients problem and restores it to normal function. A physical therapist can help create an exercise program tailored to your needs or work with you to reduce or eliminate painful injuries, spine pain and increase quality of life.